Currently the primary site candidate provides coverage for Fauquier’s EMS services along with other government radio services. Fauquier County is just west of Washington DC well outside the beltway. 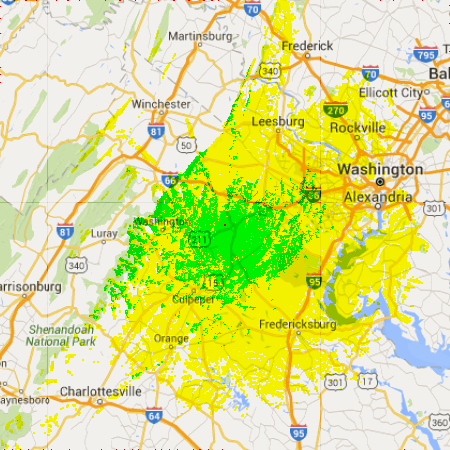 The map and coverage reveal the VHF 222 MHz coverage for the strong signal area. Warrenton is the county seat and benefits most from the primary site’s coverage. The range advantage of 222 MHz over 440 MHz is significant. The Virginia Piedmont to the east of the Appalachian mountains is quite flat and the spread of weaker coverage area in yellow testifies to this fact. Ridge lines to the west block the signal from further propagation. KYPN reports their 222 MHz port enjoys lower noise than the 2m band while preserving many of the desirable propagation characteristics. Their 222 MHz port has more users than their traditional 2m port despite fewer choices in 222 gear. The following is the same propagation study at 200 km square. Extensive testing and monitoring will confirm how realistic this coverage is. Speed is the number one complaint of local packet users. Gear exists to make 9600 practical. We need testing to see how well 9600 connections survive the 222 MHz band. The current plan for the VAPN is to have just one 222 MHz port.